Welcome to the Daintree Residence, a special place on the “Lush Side of Life”. 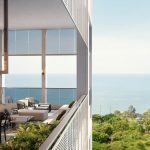 Here are homes inspired by the Daintree Rainforest, a UNESCO World Heritage natural reserve in Queensland, Australia, from which the Daintree Residences takes its name. Nature will be the setting for this brand new 5-storey condominium. Its low-rise profile will blend into a tapestry of flora, greenery, and flowing landscape. It is a fitting theme, as the location is close to the Bukit Timah Nature Reserve, one of the few patches of primary rainforests left in Singapore with a rich and diverse ecological system. 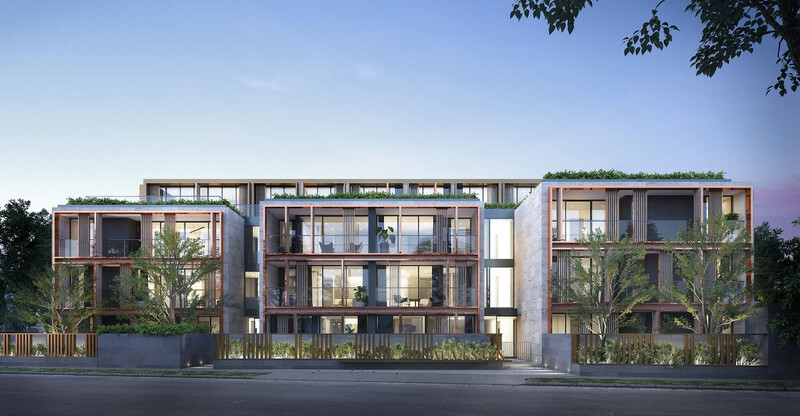 The Daintree condo sits within an established private residential area, with an oddly attractive charm arising perhaps from the predominantly landed, low-rise character of the neighbourhood. 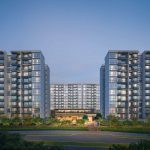 It is within walking distance of Beauty World MRT station, and is being developed by S P Setia International (S) Pte Ltd. The VIP Preview and launch will be around July 2018. The Daintree condo site is from a URA land sale, won by SP Setia International at SGD$265 million in April 2017. This translates to SGD$939 per square foot per plot ratio (PSF PPR). It drew an overwhelming number of 24 bids, well exceeding property analysts’ expectations of 5 to 16 bids and a top price of no more than $750 PSF PPR. Factors that drew the developers were positive attributes like the regular shape of the land, proximity to the Beauty World MRT Station & landed housing areas, manageable size, and proximity to amenities and major educational institutions. 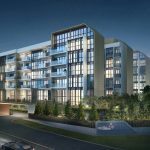 The site was also attractive to developers as it is within an established area in upper Bukit Timah that is favoured by entrepreneurs and the middle-upper income group. On top of that, there are no other new residential launches in the vicinity for the immediate future. The previous ones have sold out for some time, so there will be pent-up demand and little competition. 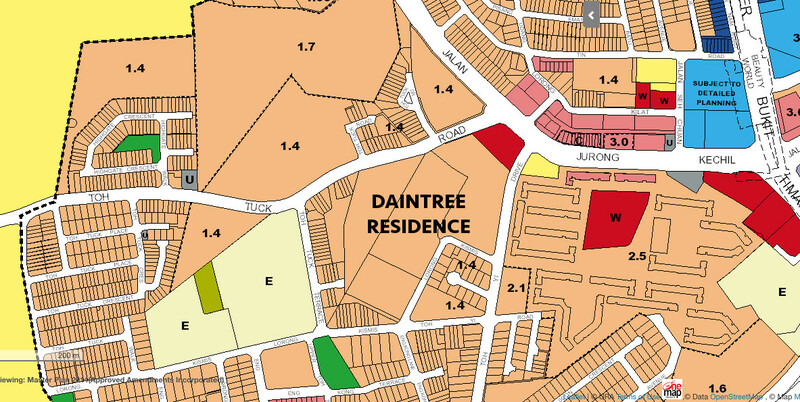 Kindly drop us a note via the Contact Form if you wish for the Daintree Residence floor plans to be emailed to you. The Daintree condo site is a longish, rectangular plot of land orientated in a north-easterly south-westerly direction. It exits onto Toh Tuck Road at its north-west corner. 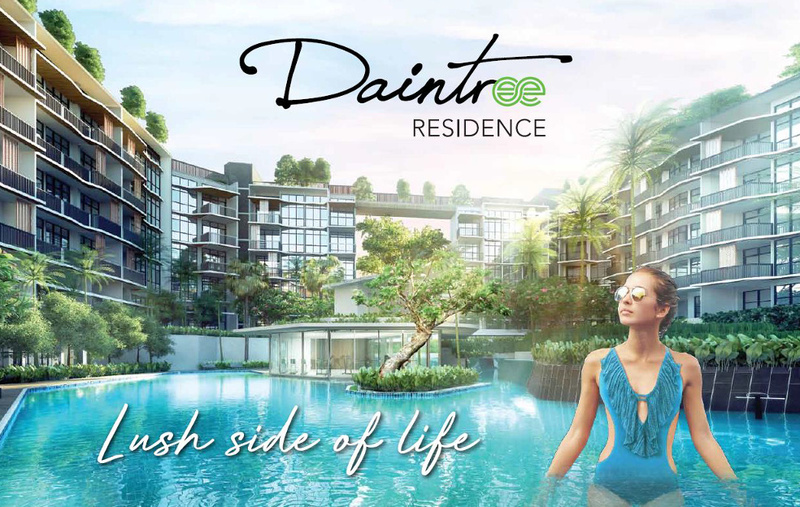 Except on the south-east where Daintree Residence overlooks landed houses at Lorong Kismis, the rest of the site is almost completely surrounded by other low-rise 5-storey condominiums & apartments. So it has the advantage of being tucked away amidst other landscaped grounds, and also has little road noise to worry about. Which makes for a peaceful secluded environment inside. Some top floor units may be able to get glimpses of Bukit Timah Hill. The Daintree showflat is available for viewing appointments. 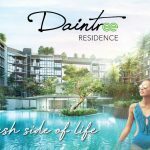 Please let us know via the Contact Form if you wish to view the Daintree condo showflat. Status as at 2 June 2018 – prices are not finalised yet. Kindly drop us a note via the Contact Form below if you wish to be kept posted on the indicative Daintree pricing. 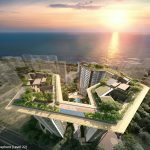 Expect the exact Daintree condo prices to be announced only on the VIP Preview sales day itself. However indicative prices may be released in advance. SP Setia bought the site for SGD$265 million. Based on the 18,721.4 square metre (sq m) site area that can yield a maximum gross floor space of 26,210 sq m, or 282,124 sq ft, this works out to a land cost of SGD$939 per square foot per plot ratio (PSF PPR). 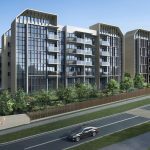 Factoring development costs that include construction, overheads, and financing, the break even costs to SP Setia is in the region of roughly $1,450 PSF. 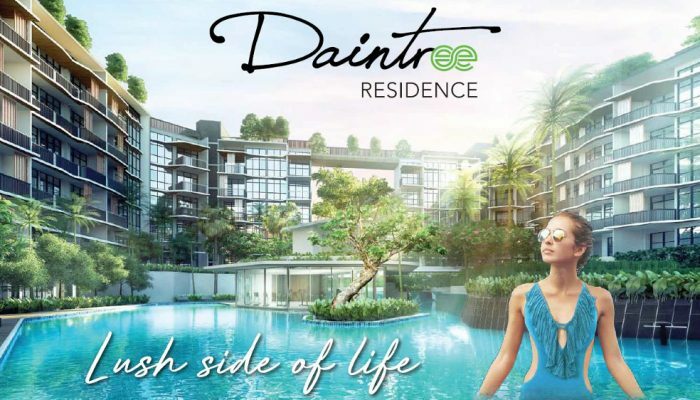 The Daintree Residence Singapore is being developed by S P Setia International (S) Pte Ltd.
S P Setia is an international multi-award winning developer, with over 40 years of experience, and projects in six countries – Malaysia, the UK, Australia, China, Vietnam, and Singapore. Established in 1974 and listed on the Kuala Lumpur Stock Exchange, S P Setia is recognised as a leading real estate firm with a diverse international portfolio that covers townships, integrated mixed developments, commercial and retail projects, luxury enclaves, and high rise homes. In Singapore, S P Setia recently completed 18 Woodsville in Potong Pasir, and Eco Sanctuary in the Dairy Farm area. Eco Sanctuary earned the Best Apartment and Best High Rise Architecture in Singapore accolade at the Asia Pacific Property Awards, Singapore’s FIABCI Property Award, BCA’s Green Mark Platinum award. 18 Woodsville also won BCA’s Green Mark Gold Award. Location. The Daintree Residence location is in a mature residential estate, in the upper Bukit Timah area, on a site formerly occupied by a school. 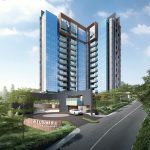 This neighbourhood is just across Clementi Road from the upmarket Bukit Timah Road area, that is traditionally one of the top residential districts of Singapore. Shops, Banks, F&B, Supermarkets. 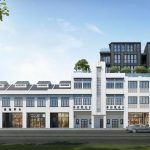 Down Jalan Jurong Kechil, between 3 to 8 minutes walk from the Daintree Residence location, are pockets of ground level shops lining the road, offering an assortment of services like clinics, spas, cafes and food outlets, car accessories. And there is Bukit Timah Market & Food Centre at the end of the road. For supermarkets, banks, lifestyle shops, and so on, you need to go further. A 12 minute walk will take you to Beauty World Centre and Bukit Timah shopping centre. And a 15 minute walk in the other direction, there is Bukit Timah Plaza. Lifestyle Amenities. This place is near Bukit Timah Nature Reserve and Bukit Batok Nature Park. Plenty of walking trails and nature there, if you are so inclined. Schools. The Daintree Residence location is within 1 km of a couple of primary schools, like Pei Hwa Presbyterian Primary, and within 2 km of Methodist Girl’s School near King Albert Park. In fact, Bukit Timah Road is famed for its top schools. An MRT train ride will bring your child directly to any of the following – Nanyang Girls High, Raffles Girls Primary, National Junior College, Hwa Chong International, Singapore Chinese Girls’ School, Anglo-Chinese Primary and Secondary. 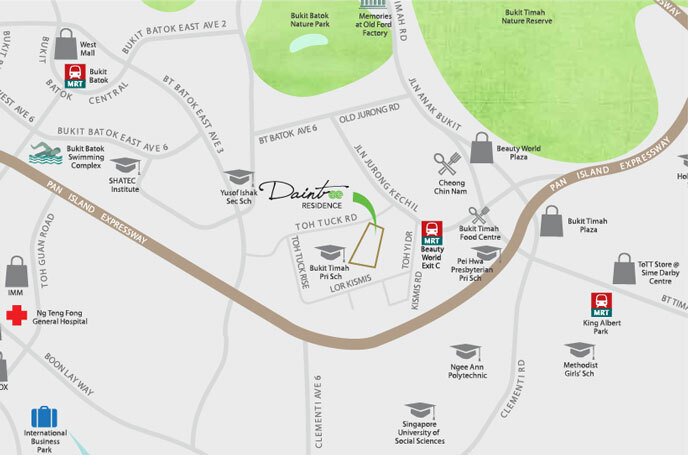 The Daintree condo location is also pretty close to Ngee Ann Polytechnic. And going south down Clementi Road, you get to the National University campus and University Town, as well as the Singapore Polytechnic. Nearest MRT Station. 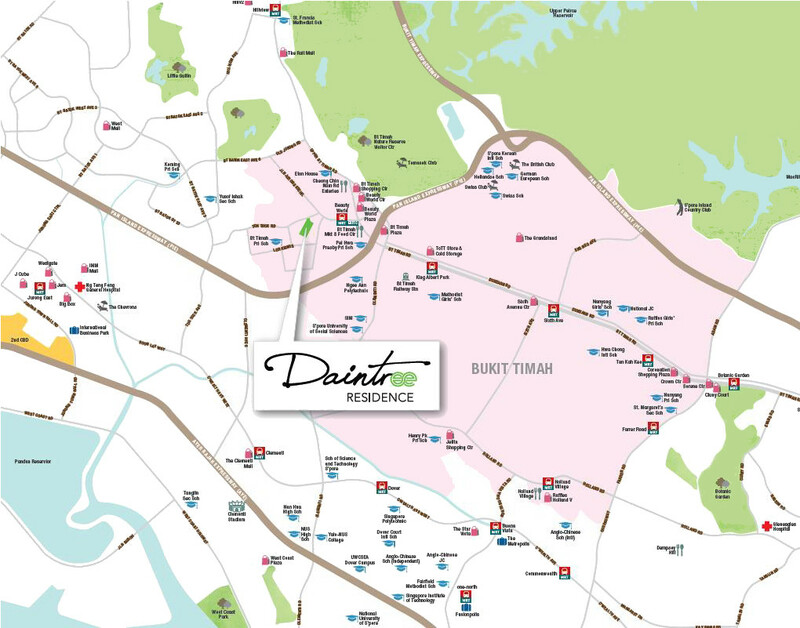 The Daintree condo location is around 600m, or 8 to 9 minutes walk, to Beauty World MRT station on the Downline Line. From here it takes 20 minutes to Orchard Road, and 30 minutes to Raffles Place and Marina Bay. Accessibility. A quick 5 minute drive takes you onto the PIE (Pan Island Expressway), which connects to other major highways, making it rather convenient for getting to everywhere else.